In a previous paper, we reported the accomplishment of a cold gene-expression system for the recombinant secretion of heterologous proteins in Pseudoalteromonas haloplanktis TAC125. This system makes use of the psychrophilic α-amylase from P. haloplanktis TAB23 as secretion carrier, and allows an effective extra-cellular addressing of recombinant proteins. However, Pseudoalteromonales are reported to secrete a wide range of extra-cellular proteases. This feature works against the efficiency of the cold-adapted secretion system, because of the proteolytic degradation of recombinant products. The aim of this study is the construction of a P. haloplanktis TAC125 mutant strain with reduced extra-cellular proteolytic activity. P. haloplanktis TAC125 culture medium resulted to contain multiple and heterogeneous proteases. Since the annotation of the Antarctic bacterium genome highlighted the presence of only one canonical secretion machinery, namely the Type II secretion pathway (T2SS), we have inactivated this secretion system by a gene insertion strategy. A mutant strain of P. haloplanktis TAC125 in which the gspE gene was knocked-out, actually displayed a remarkable reduction of the extra-cellular protease secretion. Quite interestingly this strain still retained the ability to secrete the psychrophilic amylase as efficiently as the wild type. Moreover, the decrease in extra-cellular proteolytic activity resulted in a substantial improvement in the stability of the secreted amylase-β-lactamase chimera. Here we report a cell engineering approach to the construction of a P. haloplanktis TAC125 strain with reduced extra-cellular protease activity. The improved strain is able to secrete the psychrophilic α-amylase (the carrier of our recombinant secretion system), while it displays a significant reduction of protease content in the culture medium. 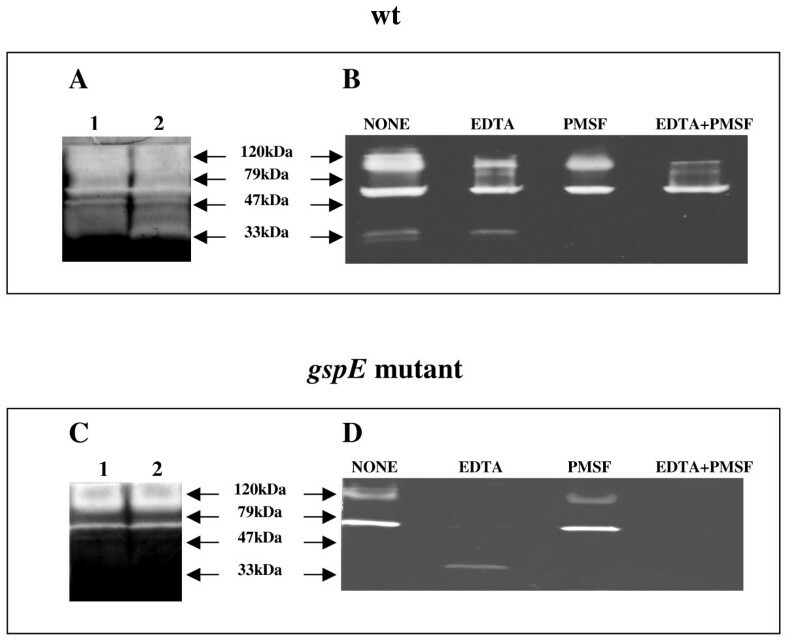 These features make the gspE mutant an improved host with a remarkable biotechnological potential in recombinant protein secretion at low temperature. Moreover this work demonstrates that P. haloplanktis TAC125 is a versatile psychrophilic host for recombinant protein production since it can be easily improved by a directed engineering approach. To the best of our knowledge, this is the first described example of a strain improvement strategy applied to an Antarctic bacterium. Protein secretion into the extra-cellular environment is one of most desirable strategy to allow a rapid and not expensive recovery of recombinant proteins. Secretion to the culture medium has several advantages over intracellular recombinant protein production. These advantages include simplified downstream processing, enhanced biological activity, higher product stability and solubility, and N-terminal authenticity of the expressed peptide [1–3]. If the product is secreted to the culture medium, cell disruption is not required for recovery. As bacteria, usually, do not secrete amounts of proteins higher then they have in the intracellular space, recovery of a recombinant gene product can be greatly simplified by a secretion strategy that minimises contamination from host proteins. Additionally, secretion can provide a method to guarantee the N-terminal authenticity of the expressed polypeptide because it often involves the cleavage of a signal sequence , thus avoiding the presence of an unwanted initial methionine on a protein that does not normally contain it. This extra methionine can reduce the biological activity and stability of the product  or even elicit an immunogenic response in the case of therapeutic proteins. In a previous paper , we reported the realization of a "cold" recombinant secretion system in the Antarctic Gram-negative bacterium P. haloplanktis TAC125. This system efficiently conjugates the obvious advantages of extra-cellular protein targeting with the positive effect of low temperature on the recombinant product solubility. Indeed, low expression temperature can facilitate the correct folding of "difficult" products [7, 8] and the use of P. haloplanktis TAC125 as expression system  allowed the efficient production of some "intractable" proteins in soluble and active form at temperature as low as 4°C [10–12]. The cold-adapted secretion system  makes use of the psychrophilic α-amylase from P. haloplanktis TAB23 [13, 14] as secretion carrier. Three chimerical proteins, made of the psychrophilic α-amylase fused to an intra-cellular protein, were translocated in the extra-cellular medium with a secretion yield always higher than 80%. The system also allowed the correct disulphide bond formation of chimera components, secreting a fully active passenger . However, our previous results addressed to a potential limit of this newly set up technology: host extra-cellular medium may contain proteolytic activities which can affect the quality of heterologous products . This feature could hamper the applicability of the cold-adapted secretion system, due to the likely recombinant product degradation. To overcome this host limit, two possible approaches can be pursued thanks to the availability of P. haloplanktis TAC125 genome sequencing and annotation : i) the gene disruption of each P. haloplanktis TAC125 gene encoding extra-cellular proteases; or ii) the inactivation of the secretion machinery responsible for the proteases extra-cellular targeting. The in silico analysis of P. haloplanktis TAC125 genome demonstrated that the bacterium possesses only one canonical secretion system, a putative Type II secretion machinery (T2SS) also called General Secretory Pathway (GSP), homologous to GSPs already described in many other Gram-negative bacteria . Since experimental evidences suggested that in P. haloplanktis TAC125 the secretion of the cold α-amylase depends on a still uncharacterized pathway (unpublished results from this laboratory), the inactivation of the T2SS machinery seemed a reasonable strategy to develop a P. haloplanktis TAC125 mutant strain with reduced extra-cellular proteolytic activity. In this paper we report the set-up of an integrative plasmid and its use for the construction of a P. haloplanktis TAC125 strain in which the gspE gene [17, 18] was knocked-out. This mutation resulted in the inactivation of the psychrophilic T2SS system. The P. haloplanktis TAC125 gspE mutant displayed a remarkable reduction of the extra-cellular protease secretion, still maintaining its ability to secrete the psychrophilic amylase (the secretion carrier of our recombinant system) as efficiently as the wild type. These features make the P. haloplanktis TAC125 gspE mutant strain an improved host with a remarkable biotechnological potential in recombinant protein secretion at low temperature. Wild type P. haloplanktis TAC125 cells were grown in TYP medium at 4°C and culture medium samples were withdrawn at different growth phases (at 24, and 32 hours of incubation corresponding to early and medium exponential phase). Concentrated culture supernatants were analyzed for proteolytic activities using Gelatine-SDS-PAGE (10% acrylamide, w/v) as described in Materials and Methods. As shown in Figure 1A, the wild type P. haloplanktis TAC125 culture supernatants contain a wide range of proteolytic activities, which display an apparent molecular weight ranging between 120 and 33 kDa. In gel analysis of extra-cellular proteolytic activities from culture supernatants of P. haloplanktis TAC125 wild type and gspE mutant strain. Panel A: Zymography of P. haloplanktis TAC125 wild type culture supernatants collected at early (24 h) (lane 1), and middle (32 h) (lane 2) exponential phase. In this experiment the zymographic developing time was 18 h, a condition that assures the detection of all proteases contained in the sample. Panel B: Protease zymography of a P. haloplanktis TAC125 wild type culture supernatant, collected at 24 h, untreated (NONE) and treated with protease inhibitors (10 mM EDTA, 10 mM PMSF, and the combination of the two inhibitors both at 10 mM final concentration). In this experiment a zymographic developing time of 12 h was chosen, this condition allows a clearer visualization and comparison of the proteases contained in the different samples. Panel C: Protease zymography of P. haloplanktis TAC125 gspE mutant culture supernatants collected at early (24 h) (lane 1), and middle (32 h) (lane 2) exponential phase, the zymographic developing time was 18 h. Panel D: Protease zymography of a P. haloplanktis TAC125 gspE mutant culture supernatant, collected at 24 h, untreated (NONE) and treated with protease inhibitors, the zymographic developing time was 12 h). A protease inhibition assay was performed by treating the 24 hours extra-cellular protein sample with 10 mM PMSF (a serine protease inhibitor) for 20 hours at 15°C, 10 mM EDTA (a metalloprotease inhibitor) for 20 hours at 15°C, and with the combination of the two inhibitors. The differentially treated samples were then subjected to gelatine zymography, and the results are shown in Figure 1B. A comparative evaluation of the results demonstrates that the wild type P. haloplanktis TAC125 culture supernatant contains extra-cellular proteases inhibited either by PMSF or by EDTA, and proteolytic activities which appear to be resistant to both the inhibitors (Figure 1B lane EDTA+PMSF). Annotation of P. haloplanktis TAC125 genome sequence  revealed that the psychrophilic bacterium possesses only a canonical extra-cellular protein secretion pathway, i.e. the Type II secretion system (T2SS). The psychrophilic T2SS is located on the larger P. haloplanktis TAC125 chromosome and it is made up of twelve genes, from the gene PSHAa0231 to PSHAa0242. The gsp gene cluster is likely arranged in several independent transcriptional units, as previously observed in other Gram-negative bacteria [19, 20]. Gene expression of P. haloplanktis TAC125 T2SS encoding cluster was evaluated by Reverse Transcriptase (RT)-PCR. Total RNA was extracted from cell samples collected at different growth phases, and was used to assess the transcription of gspE, gspC, and gspN. All the tested gsp genes resulted to be constitutively expressed in P. haloplanktis TAC125 cells (data not shown). Functional inactivation of P. haloplanktis TAC125 T2SS system was achieved by insertional mutagenesis of gspE gene. This target was selected because it encodes an inner membrane-associated ATP-synthase, which has previously been reported to be essential for the T2SS functioning in other bacteria . Insertional mutagenesis was obtained by using a suicide vector (pVS), suitably constructed for P. haloplanktis TAC125. 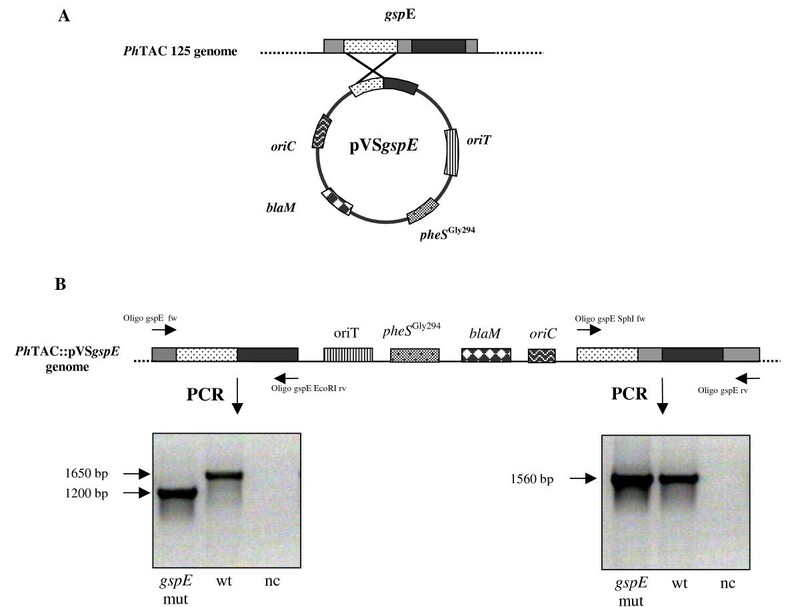 As shown in Figure 2A, the pVS vector is characterized by the presence of: i) the pJB3-derived oriT , a DNA fragment responsible for the initiation of the conjugative transfer between an Escherichia coli S17-1 λpir strain (donor) and the psychrophilic cells (acceptor); ii) the E. coli blaM gene, encoding a mesophilic β-lactamase which is used as selection gene to isolate the first site-specific integration event; iii) pheSGly294, which encodes a mutated version of the E. coli α subunit of Phe-tRNA synthase , which renders bacteria sensitive to p- chlorophenylalanine. This phenylalanine analogue can be used as counterselective agent for the isolation of those strains in which a second recombination event occurred. Schematic representation of pVS suicide vector (panel A) and genetic organization of P. haloplanktis TAC125 gspE mutant (panel B). See text for details. Two gspE gene fragments were amplified by PCR using specific oligonucleotides as primers. They correspond to two internal gene fragments and they are not adjacent (Figure 2A). The fragments were suitably digested and cloned into the pVS vector. The resulting vector (pVSgspE) was mobilized into P. haloplanktis TAC125, and clones in which a single recombination event occurred were selected on carbenicellin containing solid medium. Genomic DNA from some carbenicellin-resistant clones was extracted and subjected to different PCR analyses, to characterize the occurred genomic insertion. A positive clone was selected for further characterization, and its genome organization is reported in Figure 2B. P. haloplanktis TAC125::VSgspE mutant (hereafter called P. haloplanktis TAC125 gspE mutant) resulted to contain two copies of gspE gene, both carrying a specific deletion that was checked by sequencing the specific PCR products shown in Figure 2B. The first copy of gspE gene differs from the wild type one in lacking i) the region (450 bp long) between the two amplified fragments and ii) the 3' encoding region (Figure 2B). A transcriptional analysis demonstrated that this gspE copy is transcribed (data not shown), but due to the large deletion, the resulting gene contains a translation frame shift leading to the production of an abnormal protein. The other gspE gene copy (Figure 2B) lacks of its promoter region and of the 5' encoding portion, and therefore it resulted to be not transcribed (data not shown). P. haloplanktis TAC125::VSgspE mutant was subjected to p- chlorophenylalanine treatment to select a clean deletion mutant. Although the counter-selection was carried out in several experimental conditions, all the selected clones resulted to be meroploid strains, containing both inserted and wild type alleles (data not shown). Growth behaviour of P. haloplanktis TAC125 gspE mutant strain in standard conditions was determined, and compared with the wild type one. As shown in Figure 3A, the gspE mutant strain grows faster and makes a higher cellular biomass than the wild type strain. Concentrated culture supernatants of P. haloplanktis TAC125 wild type and gspE mutant were analyzed by SDS-PAGE and results are shown in Figure 3B. The gspE mutant culture supernatant contains a reduced number of proteins compared to the wild type. Comparison of P. haloplanktis TAC125 wild type and gspE mutant growth kinetics and extra-cellular protein contents. Panel A: growth kinetics of P. haloplanktis TAC125 wild type (open circle) and gspE mutant (solid square) in TYP medium at 4°C. Panel B: 12% SDS-PAGE analysis of tenfold concentrated culture supernatants of P. haloplanktis TAC125 wild type and gspE mutant cells grown for 32 hours. Extra-cellular protease secretion in P. haloplanktis TAC125 gspE mutant strain was investigated by gelatine zymography of concentrated culture supernatants. 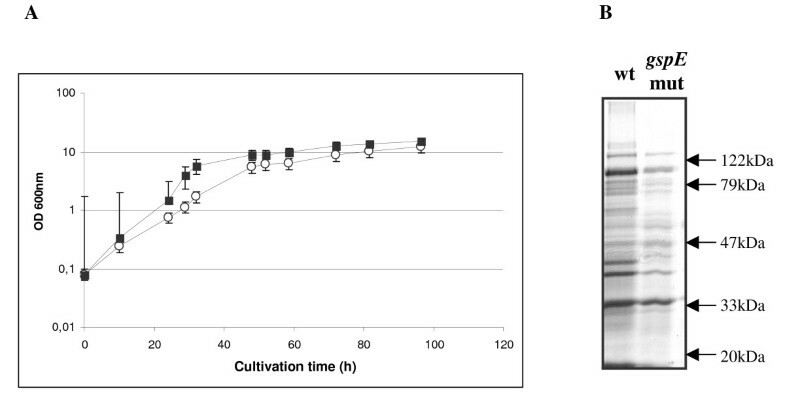 As shown in Figure 1C, the samples contain a notably reduced number of proteolytic activities as compared to the protease content of wild type samples (Figure 1A) at the corresponding growth phases. Interestingly, the combined EDTA/PMSF treatment resulted in the almost complete inhibition of the extra-cellular proteases secreted by gspE mutant (Figure 1D). Secretion of psychrophilic α-amylase in P. haloplanktis TAC125 gspE mutant cells was studied. The mutant strain was transformed with pFCamy ΔCt, a psychrophilic vector previously constructed for the recombinant secretion of α-amylase in the Antarctic bacterium . The recombinant mutant strain was grown at 4°C till medium exponential phase and the α-amylase secretion was evaluated by Western blotting analysis of cellular (Figure 4, lanes 3) and extra-cellular (Figure 4, lanes 4) protein samples. The results demonstrated that the gspE mutation does not affect secretion of the psychrophilic enzyme. Psychrophilic α-amylase secretion in P. haloplanktis TAC125 gspE mutant strain. Western blotting analysis of extra-cellular media (lane 4) and corresponding cellular extract (lane 3) of P. haloplanktis TAC125 gspE mutant transformed with pFCamy ΔCt plasmid. The western blotting analysis of extra-cellular media (lane 2) and corresponding cellular extract (lane 1) of recombinant P. haloplanktis TAC125-(pFCamy ΔCt) recombinant cells is shown as a control. The secretion of the chimerical protein AmyΔCt-BlaM, made up of the psychrophilic amylase fused to the mature β-lactamase , in P. haloplanktis TAC125 gspE mutant cells was investigated. P. haloplanktis TAC125 gspE mutant-(pFCamy ΔCt-blaM) recombinant cells were grown in TYP medium at 4°C and samples were collected at different growth phases (early, and medium exponential phase). Culture supernatants were analysed by Western blotting analysis using anti-β-lactamase (anti-Ec Bla) and anti-α-amylase (antiPh α-Amy) polyclonal antisera, respectively. As shown in Figure 5B lanes 3 and 4, both antisera detected a single product, with an apparent molecular weight of 80 kDa, corresponding to the AmyΔCt-BlaM chimerical protein. When a similar analysis was applied to wild type P. haloplanktis TAC125-(pFCamy ΔCt-blaM) recombinant cells (Figure 5A lane 1 and 2), culture supernatants contained either the chimerical protein or its different proteolysis products, i.e. AmyΔCt, BlaM, and a chimera truncated form due to the action of host-encoded secreted proteases on the passenger protein. AmyΔCt-BlaM chimera secretion in P. haloplanktis TAC125 wild type and gspE mutant. Panel A: Western blotting analyses of extra-cellular media of P. haloplanktis TAC125(pFCamy ΔCt-blaM) recombinant cells. Samples were collected during the early (24 h) (lane 1), and middle (32 h) (lane 2) exponential phase. Immunodetection was performed by chemioluminescence after probing proteins with anti-α-amylase (anti-Ph α-Amy) and anti-β-lactamase (anti-Ec Bla) polyclonal antisera. Panel B: Western blotting analyses of extra-cellular media of P. haloplanktis TAC125 gspE mutant-(pFCamy ΔCt-blaM) recombinant cells. Samples were collected during the early (24 h) (lane 3), and middle (32 h) (lane 4) exponential phase. The immunodetections were performed by using anti-α-amylase (anti-Ph α-Amy) and anti-β-lactamase (anti-Ec Bla) polyclonal antisera. In a previous paper , we reported the establishing of a versatile gene-expression system for secretion of heterologous proteins in P. haloplanktis TAC125. The system uses the psychrophilic α-amylase from P. haloplanktis TAB23 as secretion carrier, and allows an efficient extra-cellular addressing of recombinant proteins. However, we realized that the system efficiency was hampered by the presence of host-encoded extra-cellular proteolytic activities . The presence of extra-cellular proteases represents a severe limit to the use of any genetic system for the recombinant protein secretion, since host-encoded proteases can affect the quality of the heterologous secreted products. To enhance the recombinant product quality and stability, we focused our attention on the extra-cellular proteases produced by the psychrophilic P. haloplanktis TAC125 with the aim of developing a host mutant strain with reduced extra-cellular proteolytic activity. By in gel activity assay, we demonstrated that several proteases are present in the culture medium of the psychrophilic bacterium (Figure 1A). The zymographies presented in Figure 1 did not allow us to define the exact number of extra-cellular proteases, due to the low resolution of this experimental technique. However, the inhibition assay allowed us to explore at least the diversity in the action mechanisms of the psychrophilic extra-cellular proteases. Indeed, metalloproteases, serine proteases and enzymes belonging to different classes were detected (Figure 1B). Considering the multiplicity and heterogeneity of proteases detected in P. haloplanktis TAC125 culture medium, the systematic disruption of each extra-cellular protease encoding gene appears a time-consuming strategy. Therefore, we decided to inactivate the molecular machinery responsible for the extra-cellular targeting of proteases. This aim was achieved combining some information deriving from the in silico analysis of P. haloplanktis TAC125 genome with several experimental evidences. In particular, from the accurate genome annotation, it was known that the psychrophilic bacterium possesses only one canonical secretion machinery (the T2SS pathway), while we have collected evidences indicating that the psychrophilic α-amylase (the secretion carrier of our recombinant system) is likely secreted by another secretion apparatus not yet fully characterized (unpublished results from this laboratory). Thus, the functional inactivation of P. haloplanktis TAC125 T2SS seemed a feasible approach to generate a psychrophilic mutant strain possibly secreting a lower protease amount but still able to secrete the recombinant α-amylase and its chimerical derivates. T2SS (also called General Secretory Pathway) is a multi-component machinery encoded by the gsp cluster and promoting secretion of Sec- and Tat-dependent exo-enzymes in a two-step process [16, 19, 20]. Our results demonstrated that the P. haloplanktis TAC125 gsp gene cluster is actually transcribed and that the gsp genes expression seems to be constitutive over the bacterial growth (data not shown). Therefore it was necessary to use a genetic approach aimed at completely abolishing gsp-dependent secretion during all growth phases. gspE Gene [17, 18] encodes a specialized ATP-synthase whose inactivation resulted in the total loss of T2SS functionality in other Gram-negative bacteria [21, 24, 25]. Therefore the psychrophilic gspE gene was selected as target for inactivation by insertional mutagenesis. The P. haloplanktis TAC125 gspE mutant strain was constructed by applying a typical gene targeting strategy, which makes use of a suitably constructed psychrophilic suicide vector (Figure 2A). As described in result section, this mutagenesis strategy allowed the creation of a P. haloplanktis TAC125 mutant strain characterized by the absence of GspE function. A preliminary phenotypic analysis, carried out in standard growth conditions, demonstrated that P. haloplanktis TAC125 gspE mutant displays specific growth rate and biomass productivity higher than the wild type strain, thus surprisingly the mutation does not affect but improve the bacterium fitness (Figure 3A). This observed gspE mutant behaviour could be justified considering that gsp-dependent protein secretion is a high costly metabolic process, and its inhibition may represent an advantage to gspE mutant strain, at least in the tested growth condition. The analysis of the extra-cellular protein content demonstrated that gspE mutant actually secretes lower amounts of proteins with respect to the wild type strain (Figure 3B). Proteins secreted by the gspE mutant are translocated by secretion pathways different from T2SS, such as the specialized machineries for type IV pili and curli components secretion  and the secretion apparatus responsible for the recombinant α-amylase secretion (unpublished results from this laboratory). Zymographic analysis revealed that the gspE mutant strain medium contains a notably reduced number of proteolytic activities (Figure 1C) with respect to wild type culture supernatants (Figure 1A). In contrast, knocking out of gspE gene did not impair for secretion of the cold-adapted amylase (Figure 4). In fact, P. haloplanktis TAC125 wild type and gspE mutant strains resulted to be indistinguishable in terms of cold-adapted α-amylase production and secretion yields. 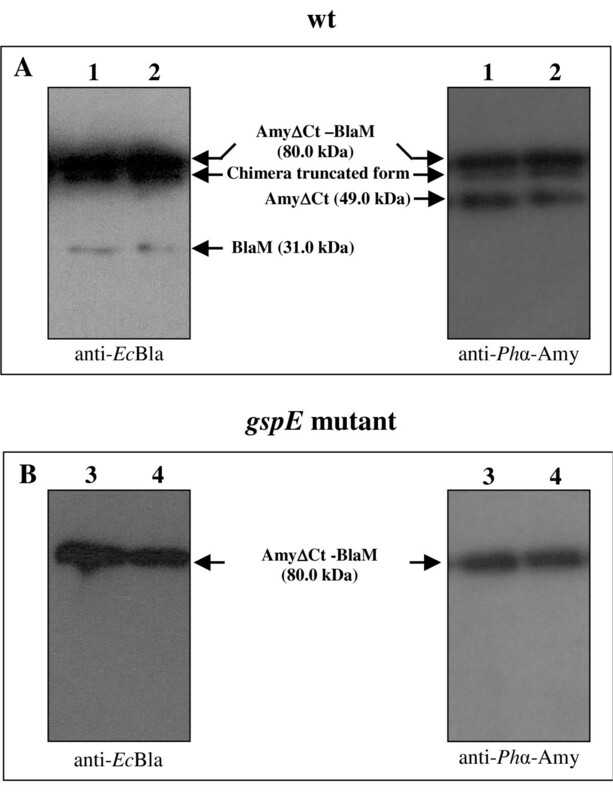 The gspE mutant was further tested for its ability to secrete a α-amylase chimerical product, the AmyΔCt-BlaM chimera. When produced by wild type cells, the chimera components (i.e. the psychrophilic α-amylase and the mesophilic β-lactamase) (Figure 5A, lanes 1 and 2) are partially separated due to the sub-stoichiometric proteolytic cleavage of the linker which connects the two proteins (see also ). This processing does not affect the catalytic activity of each component of the chimera . The host-encoded secreted proteases are also responsible for further chimera degradation (see "chimera truncated form" in figure 5A, lanes 1 and 2) which accounts for the previously reported and undesired decrease of passenger activity . On the contrary, due to the reduced number of extra-cellular proteases present in culture medium, AmyΔCt-BlaM chimera accumulates as a unique unprocessed form when produced in P. haloplanktis TAC125 gspE mutant cells (Figure 5B, lanes 3 and 4), thus resulting in an enhancement of chimera quality over the whole production process. Combining the experimental evidences we collected on the α-amylase secretion machinery in P. haloplanktis TAC125 with the careful in silico analysis of its genome, we designed an simple and successful experimental approach for the construction of an improved psychrophilic host for the cold α-amylase-dependent recombinant secretion system. In fact, by a single gene disruption, involving the psychrophilic gspE gene, we developed a P. haloplanktis TAC125 mutant strain which secretes a significantly reduced extra-cellular protease activity while keeping its ability to secrete the recombinant psychrophilic α-amylase as the wild type strain. The gspE mutant strain is also characterized by specific growth rate and biomass productivity higher than wild type strain, making it a truly improved host with a remarkable biotechnological potential in recombinant protein secretion at low temperature. Moreover, this work demonstrates that P. haloplanktis TAC125 is a versatile psychrophilic host for recombinant protein production since it that can be easily improved by a directed engineering approach. To the best of our knowledge, this is the first described example of a strain improvement strategy applied to an Antarctic bacterium. P. haloplanktis TAC125 was isolated from Antarctic sea water . Escherichia coli DH5α  was used as host for the gene cloning. E. coli strain S17-1(λpir) was used as donor in interspecific conjugation experiments . P. haloplanktis TAC125 was grown in aerobic conditions at 4°C in TYP broth (16 gr/L yeast extract, 16 gr/L bacto tryptone, 10 gr/L marine mix) at pH 7.5, supplemented with ampicillin 200 μg/ml, chloramphenicol 25 μg/ml, or cabenicellin 30 μg/ml, when required. Antarctic bacteria transformation was achieved by intergeneric conjugation as previously reported . E. coli cells were routinely grown in Terrific broth  at 37°C. When required, antibiotics were added at the following concentrations in liquid cultures: 100 μg/ml of ampicillin, or cloramphenicol at 50 μg/ml final concentration. Genetic manipulations were carried out following standard procedures . P. haloplanktis TAC125 DNA genomic purification was performed by ChargeSwitch gDNA Mini Bacteria Kit (Invitrogen). Protein samples were analyzed by Polyacrylamide Gel Electrophoresis (Sodium Dodecyl Sulphate-PAGE) (12% acrylamide, w/v) according to standard methods . For immunoblotting, the proteins were transferred to a polyvinylidene difluoride membrane (Immobilon PSQ, Millipore). For immunodetection of proteins, P. haloplanktis TAB23 anti-α-amylase  or anti-β-lactamase antisera were diluted in blocking buffer (phosphate buffer saline; 5% skimmed milk). Peroxidase conjugate anti-rabbit IgG (Sigma-Aldrich, USA) was used as secondary antibody. Proteins were detected by chemiluminescence's (Pierce, USA). pVS suicide vector was constructed by the insertion of the pJB3-derived oriT  and pheSGly294 gene  into the pGEM7Z vector. The oriT, responsible for the initiation of the conjugative transfer, was amplified on pJB3 vector by using Oligo oriTEcoRIfw and Oligo oriTSacIrv as primers (see Table 1), and was cloned into EcoRI and SacI sites of pGEM7Z (pGEM7Z-OriT). pheSGly294 gene, which encodes a mutated version of the E. coli α subunit of Phe-tRNA synthase, was amplified using pKSS  vector as template. The PCR reaction was carried out using the oligonucleotide pair PheSSNfw and PheSXrv, designed to introduce Nde I and Xba I restriction sites. The amplified DNA fragment was subjected to double Nde I/Xba I digestion and cloned into pPM13 plasmid  corresponding sites generating pPM13-pheSGly294 vector. The DNA fragment, containing P13 promoter and pheSGly294 gene, was recovered from pPM13-pheSGly294 vector by SmaI/EcoRI digestion, filled in and cloned into the pGEM7Z-oriT NaeI restriction site, resulting in the construction of the pVS vector. Two DNA fragments of P. haloplanktis TAC125 gspE gene were amplified by PCR using bacterial genomic DNA as template. Two primer pairs were designed to amplify a 567 bp region at the 5' end (Oligo gspESph Ifw, Oligo gspESac Irv) and a 621 bp region at the 3' (Oligo gspESac Ifw, Oligo gspEEco RIrv) end of the gspE gene. The amplified DNA fragments were digested by SphI/SacI and EcoRI/SacI and cloned into the pVS Sph I/Eco RI site to generate the pVSgspE vector. The resulting vector was mobilized by intergeneric conjugation  into P. haloplanktis TAC125, and the cells were plated at 4°C on TYP solid medium containing 30 μg/ml carbenicellin to select those clones in which a single recombination event occurred. All PCR amplifications were performed in standard conditions . The amplified fragments were cloned and their nucleotide sequences were checked to rule out the occurrence of any mutation during synthesis. P. haloplanktis TAC125 wild type and gspE mutant strains were grown in standard conditions and culture samples were collected at different growth phases as reported in the text. Samples were centrifuged at 10000 × g for 5 min at 4°C and the upper phase was collected for further analysis. The collected culture media were tenfold concentrated by Centricon (AMICON, exclusion size 5 kDa), and 12 μl were loaded onto a non reducing SDS-PAGE containing gelatine (1.5 mg ml-1). After electrophoresis, gel was soaked twice with 2.5% Triton X-100 (v/v) solution for a total of 60 min to remove SDS. The gel was then incubated in a developing buffer (50 mM Tris-HCl, pH 7.5, containing 5 mM CaCl2) for 12 or 18 (as indicated) hours at 15°C, rinsed with water, and stained with Coomassie blue R250. Areas of gelatine digestion, corresponding to proteolytic activities, were visualized as unstained regions in the gel. Tenfold concentrated culture supernatants of P. haloplanktis TAC125 wild type and gspE- mutant cells were incubated with no inhibitors, or 10 mM EDTA, or 10 mM PMSF, or a combination of EDTA and PMSF (both at 10 mM final concentration) at 15°C for 20 hours. The samples were then subjected to protease zymographic assay. We are grateful to Dr. Gerard Michel (LISM/IBSM CNRS 31 Chemin J. Aiguier 13402 Marseille) for critical reading of the manuscript and very helpful discussions. This work was supported by grants of Ministero dell'Università e della Ricerca Scientifica (Progetti di Rilevante Interesse Nazionale 2006) and of Programma Nazionale di Ricerche in Antartide 2004.